This is not a Champagne and sparkling wine blog, although if you’ve been scrolling through recent posts you could be forgiven for thinking that it is. It’s just I’ve been quite taken by fizz of late. So I was pleased to be able to try this South African sparkling wine recently, which is creating quite a stir in its home country, but which hasn’t yet made its way here to the UK (although some is on its way with Gudfish). 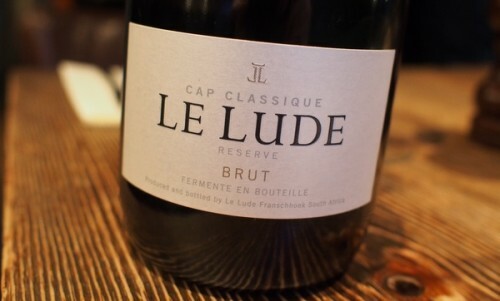 it’s from Le Lude in Franschhoek, and it is made by Paul Gerber, a sparkling wine specialist. While Le Lude is based in Franschhoek, the grapes are sourced from a range of regions, many of which are cooler climate. This wine, based on the 2012 vintage, is the first release and I was really impressed. No need to apologize for writing about fizz Jamie Goode, it’s a category that needs more attention from wine writers and bloggers. Especially I think outside of the polar opposites of luxury Champagne and plonk supermarket Prosecco. Keep up the good work, Jamie. I tasted Le Lude last month on a visit to Franschhoek. I believe it is the best MCC I have tasted in South Africa, more French in character than South African. The tasting room is beautiful too!